As a researcher, I examine the extra-partisan motivations that encourage political actors to favor electoral reform, in particular the way in which these motivations countervail partisan self-interest. Examples from my work include: geographic loyalty (published), predispositional core values (job market paper), and nationalistic attitudes such as American exceptionalism (in progress). Methodologically, I use both observational and experimental approaches. A central tenet in the electoral systems subfield is that parties, when in power and motivated by partisan self-interest, seek desired outcomes via the strategic adoption of electoral rules. Such a focus, however, omits a key point: electoral rules also distribute power among geographic units. If, within a party, the partisan and geographic interests of some members conflict, then the canonical relationship between partisanship and rule choice may be conditional. The U.S. electoral college provides an opportunity to test for such intra-party variation, because it advantages some states over others and thus makes salient geographic allegiances. Using an original dataset on one reform proposal, the National Popular Vote Interstate Compact (NPVIC), I find evidence of competing loyalties. 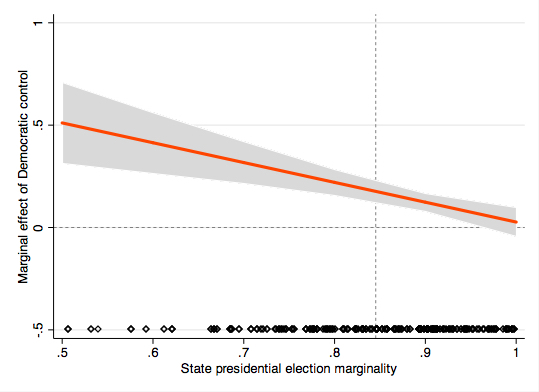 Although NPVIC advances furthest when Democrats control state lawmaking, a state's status as a swing (but not as an overrepresented) state weakens the relationship to the point where even Democrats are unlikely to aid NPVIC. A central tenet in the electoral systems subfield is that parties, when in power and motivated by partisan self-interest, seek desired outcomes via the strategic adoption of electoral rules. Such self-interest, however, is merely one explanation for why actors may seek to reform electoral rules: a second potential motivation is that an actor may attempt to maximize her core values, which constitute her understanding of the 'common good' (i.e., her perception of what is beneficial for society as a whole rather than for a particular, narrow interest). Although the extant literature has demonstrated the motivational power of core values (e.g., egalitarianism, moral tolerance, self-reliance), the effect of these predispositions on electoral rule choice has heretofore not been tested. Using a factorial experimental design that manipulates the partisan- and values-implications of a fictitious reform proposal on absentee voting, I find strong evidence of a role for core values: not only do they have an important effect net of partisan concerns, but also, dramatically attenuate the effect of partisan self-interest in instances in which the two predispositions have been made to countervail. The results, then, provide evidence that partisan self-interest is far from the only game in town: actors hold, and attempt to pursue through electoral reform, objectives other than those that are immediately partisan in nature. I am in the process of examining the relationship between nationalistic attitudes, in the form of American exceptionalism, and support for electoral reform. I focus on the proposed implementation of 'foreign' rules (e.g., ranked-choice voting (RCV), gender quotas, compulsory voting) that have little-to-no history in the U.S. Because individuals who believe in American exceptionalism by definition view the U.S. as being 'superior' to other nations (perhaps even having a 'mission' to spread American-style democracy abroad), I theorize that exceptionalists should, holding partisan self-interest constant, be more likely: 1) to favor the exportation abroad of American electoral rules; and, 2) to oppose the importation to the U.S. of other countries' rules. To gauge the mass public's attitudes on exceptionalism, I am creating and validating an original survey battery, and will in January field the battery, as part of a framing experiment on electoral reform, on the Vanderbilt Latin American Public Opinion Project's AmericasBarometer U.S. survey (which I am coordinating). This survey experiment will also collect partisan information, so that after establishing the net effect of exceptionalism on reform, I can investigate the extent to which partisan concerns and exceptionalism interact on the issue.